It’s time to celebrate! Your joy could be the result of a wonderful wedding, the holidays, family reunions, the announcement of an engagement, good fortune – if it makes you happy, then this card is saying that it’s coming your way. All positive emotions are favored, any difficult relationship issues are resolved, and the mood is festive and full of good cheer. This isn’t the time for serious endeavors – think carefree, relaxed, and fun. 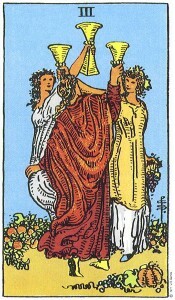 In a reading, the Three of Cups can reference specific holidays, generally those falling a few weeks or months after it is drawn. In other words, drawing this card in late fall could mean good news by Thanksgiving, Christmas or New Year’s Eve, while drawing it in late winter could imply good news by the Easter holidays. 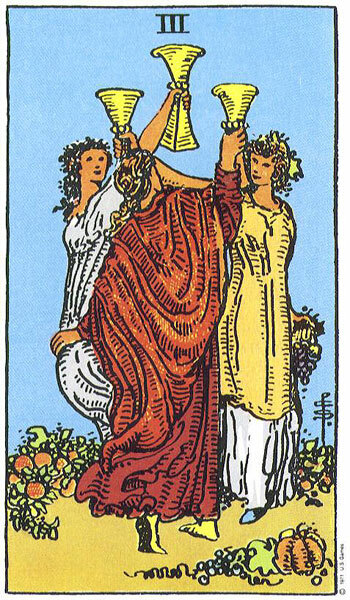 Drawing this card is a sign to enjoy life and share in its joy and wonder with others.